Well, it's that time of the.. week? Another photo. This time it's a young kitten named Simon. He's a red Persian kitten. Although I'm not a big fan of Persians myself (too much fur! ), these kittens were a big surprise! I had always thought Persians were docile and calm cats. I was hoping I could just pose the kitten any way I liked, and it would stay put. No such luck. They're as active as any other kitten, not sitting still for very long at a time. And running around the floor like crazy. It was a fun visit. Simon grew up at the av Flamingo Persian and Exotic cattery. My mommy likes it ^^ and me too! Always thought Persians were the dumb blonds of the cat world. Glad to be wrong. This is photo is to adorable. So cute i love this cat! Adorable kitten! Bet she's all grown up by now. I can't resist saying this... "Awwwwwwwwwww!" OMG! So adorable! I just love this pic! Please go to our Journal and find the “Top Submission” journal to see the feature! If you have already seen it, please disregard this message as I am sending it to everyone who was featured! OMG, this is too adorable. Nice photo of a very sweet-looking kitten. 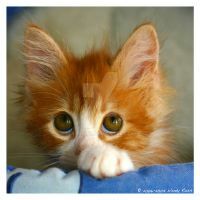 Hey, it's almost exactly like our kitty...^^ Really cute photo! D'AAAAWWWW, he's so cute! Beautiful picture! Looks like GARFIELD, but not as fat as Garfield.